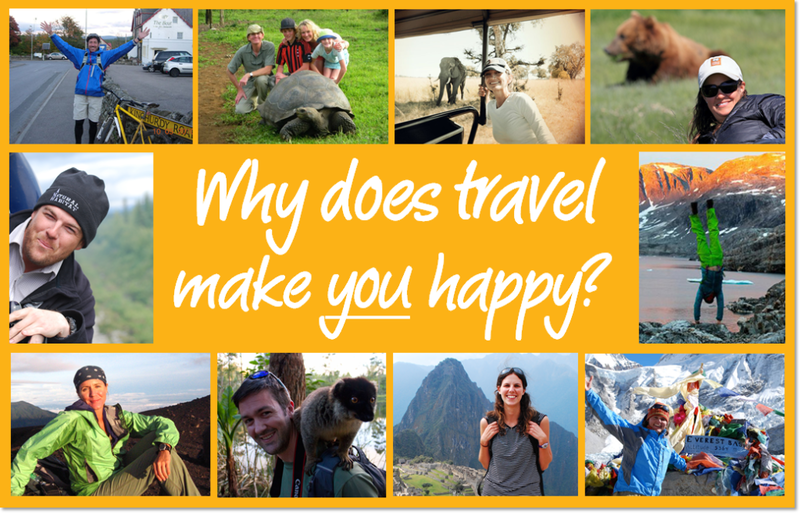 We want to know: Why does travel make you happy? March 20th is International Day of Happiness, a special day created by the UN General Assembly to officially recognize the importance of happiness as a fundamental human goal and aspiration in everyone’s lives around the world. The UN drew its inspiration for the day from Bhutan, a country that measures its prosperity in Gross National Happiness, instead of GDP. WWF and the Government of Bhutan recently created an innovative funding initiative called “Bhutan for Life.” Funding from this program will be used to maintain the country’s parks and wildlife corridors in perpetuity. Now that’s something to be happy about. You can see Bhutan’s beauty for yourself on Nat Hab and WWF’s Natural Jewels of Bhutan & Nepal tour. Speaking of travel, it’s no secret to any globetrotter that travel makes us happier. It’s a proven fact! But the reasons travel evokes happiness are different for each person. In honor of International Day of Happiness, we want to know — why does travel make you happy? Share your answers in the form below! We’ll be publishing the answers in an upcoming blog post.